This is another one of Mickael Chatelain’s creations that is highly visual and uses an ingeniously conceived gimmick. The name “SwitchBox” can be a misnomer. It does not refer to a special box in which an object placed inside it is switched into another object. 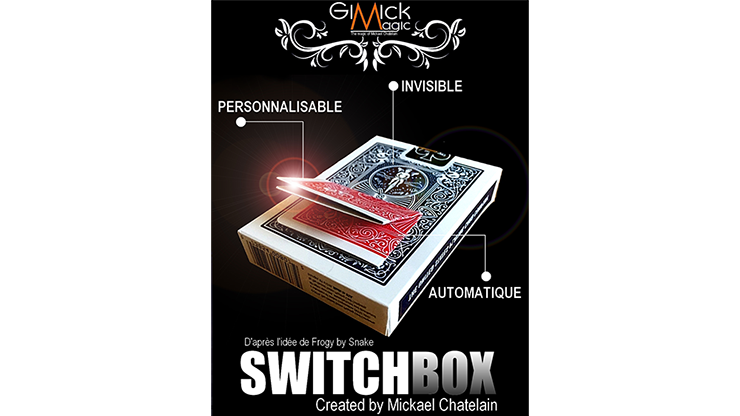 The SwitchBox is a poker-sized Bicycle playing card case. A folded playing card sits on top of the box. When the folded card is picked up, it switches undetectably into another folded playing card. Here is the basic routine for using SwitchBox. A folded playing card is held onto the outside of a card box with an elastic band. The flap of the card box is opened and the deck of playing cards is taken out of the box. The elastic band is removed and the folded card is left sitting on top of the box. A card is freely chosen from the deck, and signed. It is then lost back into the deck. The performer asks the audience how long they think he will take to find the signed card. A time period is named. What if he does it even without looking at the deck of cards at all, that is, if he brings the deck behind his back or under the table? A longer time period is named. The performer brings the deck behind his back (or under the table). In less than a minute, he brings the deck out again. He has already done it. He points to the folded card on top of the card box that was there all along even before the trick begins. By now, the audience is thinking “No way!” The performer picks up the folded card from the box, unfolds it, and shows that it is indeed the signed card! The signed card travels back in time! There is hardly any difficult sleight-of-hand being used. Mickael also teaches an alternative version where you do not have to bring your hands behind your back or under the table. You need to be able to perform a classic card move and the entire effect can be performed without having to go undercover. You receive the very well-made gimmicked Bicycle card box and a couple of accessories. Each box is hand-made and works very smoothly. When ordering, you need to specify whether you want a red or blue colour Bicycle card box. You are also given a link to download a set of video instructions. You need to supply your own folded playing card and also put the finishing touches to the box. Do not worry about this – there is no contruction work needed, only how to finish setting up the box. English is not Michael’s first language. But you will have no difficulty in understanding what he wants you to do in the video. Resetting the box is quite instantaneous. If part of the gimmick breaks, spares are supplied. Obviously the SwitchBox is capable of other applications, such as a folded piece of paper changes into a folded bill, or a red back folded card changes into a blue back folded card. However, to utilise the SwitchBox in this manner implies that a switch has taken place. The original routine is the best use of the SwitchBox.